A Virginia woman who was driving to work was shocked to find a bobcat lodged in the grill of her car onThanksgiving morning. Richmond Animal Care and Control (RACC) Director Christie Peters said the woman knew she had hit something in Gloucester County, but it was not until 50 miles later when she parked her Prius in Richmond did she make the discovery, according to CBS. The animal care and control agency was called in to sedate the animal and return him to the wild. Peters said she received a text from her colleague RACC Officer Barbara Jones informing her about the bobcat and asking for advice. “Officer Jones sent me a text message at 8:06. And the text was, ‘I’m on a call with a bobcat stuck in the grill of a car – and he’s still alive,” Peters told CBS. Despite the hour-long journey, Peters said after examination the bobcat had only suffered a cut on his back. 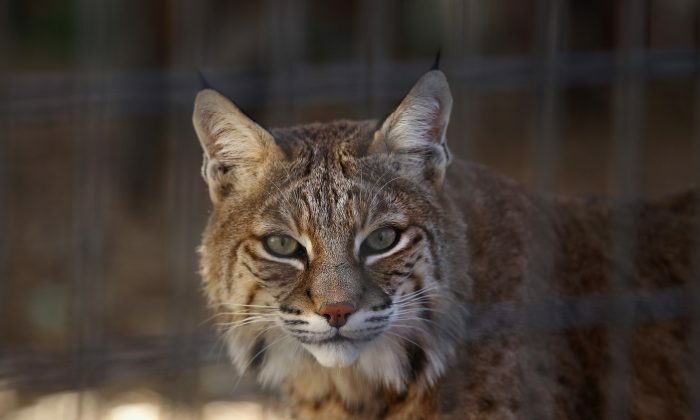 The bobcat was transported to the Wildlife Center of Virginia in Waynesboro and will eventually be released back into the wild near the crossroads where he was hit in Gloucester. According to Department of Game and Inland Fisheries, bobcats are usually found in heavily forested, mountainous or rugged terrain, but they can also live near wooded districts near farms and human habitation. “We just don’t ever get a chance to be so close to such beautiful, wild creatures and it was just wonderful to know that he made it through such a weird, crazy situation,” Peters told the news station. “It’s perfect that it was Thanksgiving … because it was just a miracle and we’re so grateful that it ended the way that it did,” she added. Dear reader, we have a little favor to ask of you. We work hard to deliver important and interesting articles to you, but we can’t do it without ad revenue. Please help support independent journalism by sharing this article with your friends and family. It takes less than a minute. Thank you!